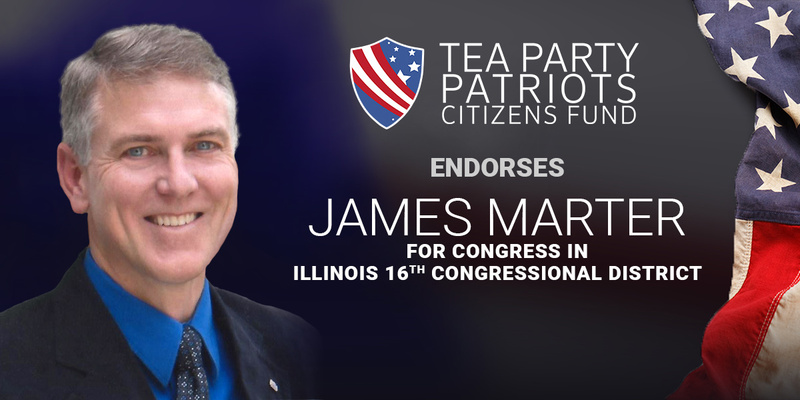 ATLANTA, Ga. – Tea Party Patriots Citizens Fund (TPPCF) Chairman Jenny Beth Martin today released the following statement, announcing that the Super PAC associated with the nation’s largest Tea Party group has endorsed James Marter for the GOP nomination for Congress in Illinois’ 16th congressional district. “Illinois’ 16th congressional district has been represented for the last seven-plus years by a fraud, a man who made campaign promises to win Tea Party support when he first ran in 2010, and then abandoned them once he took office. Adam Kinzinger has a history of voting for huge spending bills, and never misses an opportunity to smack the conservatives in the House Freedom Caucus. His Conservative Review score is a miserable 34 – that’s the worst score for a Republican in Illinois – and his Heritage Action score isn’t much better, at 43. Adam Kinzinger has proven he is no conservative, and he certainly is not Tea Party. “Oh, and one more thing – what does it say about his Republican credentials that he loudly announced he would not, and did not, vote for President Trump over Hillary Clinton? “The good news is, Republicans in the 16th district have a choice. James Marter is a solid constitutional conservative. He’ll fight for pro-growth tax reform to create more and better-paying jobs, and he’ll vote against spending money stolen from our children. He’ll fight for strong enforcement of our immigration laws and to strengthen border security, and he’s got a 100% candidate rating from the NRA. And he will vote to repeal ObamaCare. “Many of our supporters in Illinois remember James from the strong challenge campaign he ran against former Sen. Mark Kirk in 2016. From all over the state, we have heard from our supporters that they are working for James, and they want us to endorse his campaign for Congress.